Aristotle was born in 384 B.C.E. in Stagirus, Macedonia, Greece, the son of Nicomachus, a medical doctor, and Phaestis. Little is known about Aristotle's early years, though he was almost certainly meant to become a doctor like his father, who died when Aristotle was ten years old. As his mother had died some years earlier, Aristotle was brought up by Proxenus of Atarneus, possibly a family friend or uncle. Proxenus taught Aristotle poetry, Greek, and public speaking; Aristotle had already learned science as a part of his early medical training by his father. At seventeen, Proxenus sent Aristotle to Athens to continue his education under Plato. 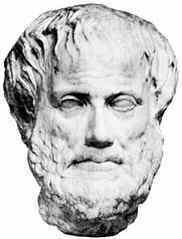 Aristotle differed from Plato in some of his views and beliefs. While Aristotle agreed with Plato that the cosmos is designed in a rational way, Aristotle thought that the universal could be found in particular things, while Plato believed the universal exists apart from particular things. Plato focused on mathematics and metaphysics, while Aristotle focused on physics, mechanics, and biology (nature). Despite these differences, after Plato's death in 347 B.C.E., Aristotle continued in his association with other Platonists. Aristotle married Pythias, the adopted daughter of Hermias, ruler of Atarneus, after Hermias' murder by the Persians. After traveling for some years in Asia Minor, Aristotle returned to Macedonia in 338 B.C.E. in order to tutor Alexander the Great. Aristotle then went to Athens after it was conquered by Alexander and created a school, the Lyceum or Peripatetic School, in 335 B.C.E., running it for twelve years. In 323 B.C.E., Alexander died, and the capital was overrun by Macedonians. Aristotle fled prosecution and charges, escaping to Chalcis in Euboea, Greece. He died there in 322 B.C.E. Aristotle's works in print are mainly written versions of his lectures. The texts were edited by Andronicus of Rhodes in or around 100 B.C.E. These works include: De Poetica (Poetics), Organum, Rhetoric, Categories, Nicomachean Ethics, Eudemian Ethics, and On the Soul (De Anima), all said to be written in 350 B.C.E. Describes qualities attributed to things can be classified. A book about the 'laws' of literature and story telling. Literally detailing Aristotle's view on government, it is the second part of a treatise that includes "the Ethics."